In which we learn that the view is the best part of the movie. 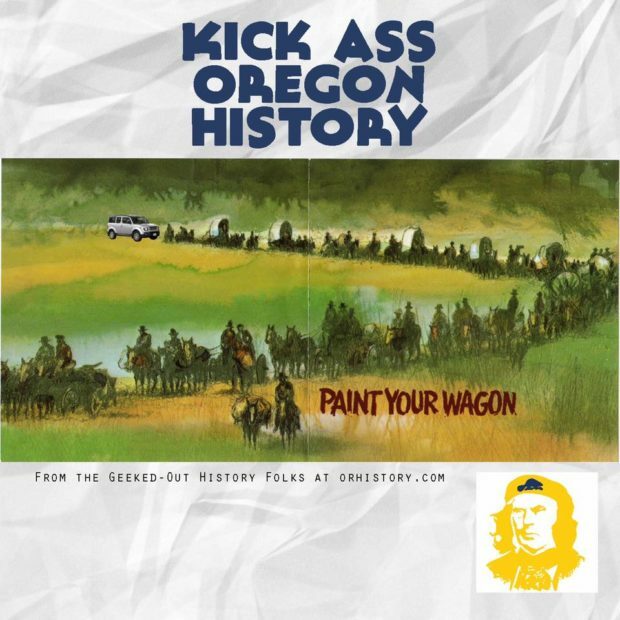 A HUGE THANK YOU to this podcast’s sponsors – Oregon Film, Dogwood Distilling, pFriem Beer, Trailhead Coffee, and the Geiser Grand Hotel in Baker City. Thanks to Sara Anson Vaux for her insight on Clint Eastwood. Thank you to Matthew Cowan of OHS (who says that he misspoke on the tape, and PYW was filmed on 35mm, and blown up to 70mm). Here are our photos of the film set. Here is a trailer for Paint Your Wagon, and here is the Simpson’s version of the film. ***EDIT! Our November 2017 viewing at the Hollywood Theater in Portland had some great press, including KATU, KPTV 12, and one of the selected events of the week from the Portland Mercury! We hope to see you at the Hollywood on 11/16/2017. We hear tell that LEE MARVIN’s PANTS will be on display! Proceeds from the ticket sales will benefit the Baker Heritage Museum.